For a sweet soufflé omelet, substitute a pinch of sugar for the salt. Fill with preserves or fruit. Top with powdered sugar or dessert sauce. Heat oven to 350°F. 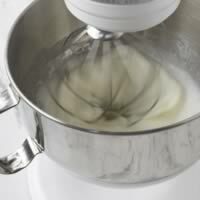 Combine egg whites, water, and cream of tartar in large mixer bowl. Beat on high speed until stiff but not dry, just until whites no longer slip when bowl is tilted. Beat egg yolks and salt in small mixer bowl on high speed until thick and lemon-colored. Gently but thoroughly fold yolks into whites. Heat butter in 10-inch nonstick omelet pan or skillet with oven-proof handle over medium-high heat until hot. Pour in egg mixture; gently smooth surface. Reduce heat to medium. Cook until omelet is puffed and lightly browned on bottom, about 5 minutes (lift omelet at edge with spatula to judge color). Place pan in 350°F oven. Bake until knife inserted halfway between center and outer edge comes out clean, 10–12 minutes. Loosen omelet edge with spatula. Serve immediately.